The Barcelona striker was present in Lausanne for his hearing this morning. LUIS SUAREZ ARRIVED in Lausanne this morning to plead his case before the Court of Arbitration for Sport (CAS) to halve his four-month FIFA ban for biting. Barcelona’s Uruguayan striker, in a blue checked shirt and jeans, was tight-lipped as he ran the gauntlet of press photographers on his way into the hearing shortly before 10 am local time (0800 GMT). He emerged almost five hours later, still refusing to comment on the proceedings. He was ferried off in a black van, but not before stopping to sign autographs for some waiting children. Suarez was banned from all football-related activity for four months after biting Italy defender Giorgio Chiellini on the shoulder during a World Cup group game in the Brazilian city of Natal. He subsequently left Liverpool for Barcelona in a €95 million deal but will have to wait until late October before he can play for his new club. His legal team said they were confident of obtaining a reduction of the ban to two months, meaning the former Liverpool striker would be available to play from 25 August, and for him to be allowed to train with Barcelona for the duration of his suspension. The verdict is not expected for a couple of days. Email “CAS proceedings begin as Suarez looks to get four-month ban halved”. 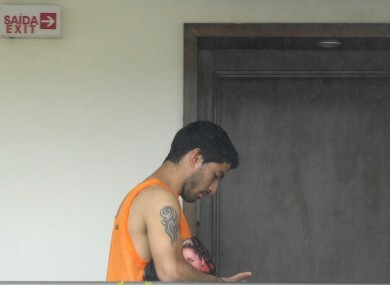 Feedback on “CAS proceedings begin as Suarez looks to get four-month ban halved”.